Part of the 1st generation of CLD models, the Nordon CLD was introduced in 1948 when the 18 jewel, 8/0 sized 748 movement was introduced. 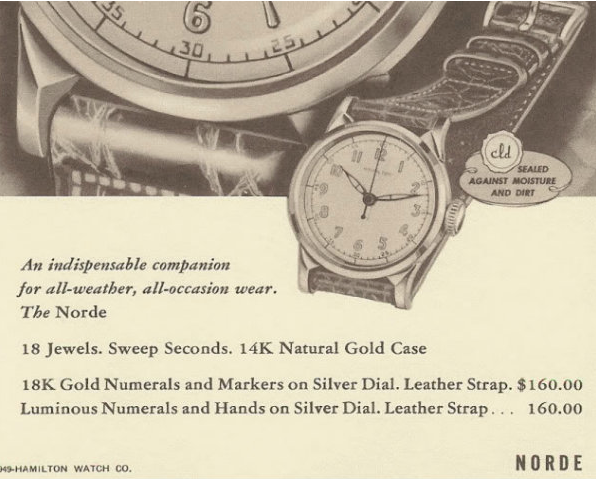 The same watch but in a 14K solid gold case was introduced the following year and called the Norde. 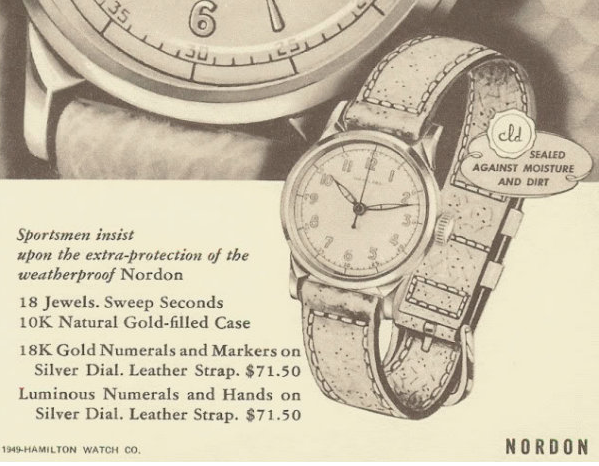 Both watches were produced until 1952, at which point the 2nd generation of CLD watches were introduced. The Nordon shares a lot of similarities with the Langdon CLD. The 10K gold filled cases are virtually identical except the model name is often stamped inside the two-piece case's back. The main difference between the two models is the Langdon used the 747 movement with a sub second hand. CLD watches feature a series of gaskets to seal the case from the elements. One goes around the crystal, one the bezel and the third is inside the crown. CLD watches are not "waterproof" but they are more robust to the environment than other watches - assuming the gaskets are still intact. Unlike the earlier sweep second hand movement, the 987S, the 748 movement does not hack, or stop, when you pull out the stem to set the time. Two dial options were available, the AGN dial (most common) and the luminous dial with matching hands. The luminous dial and hands always remind me of the "Cheshire Cat" as the hands at the 10:12 position look like cat's eyes. All that's missing is the smile. 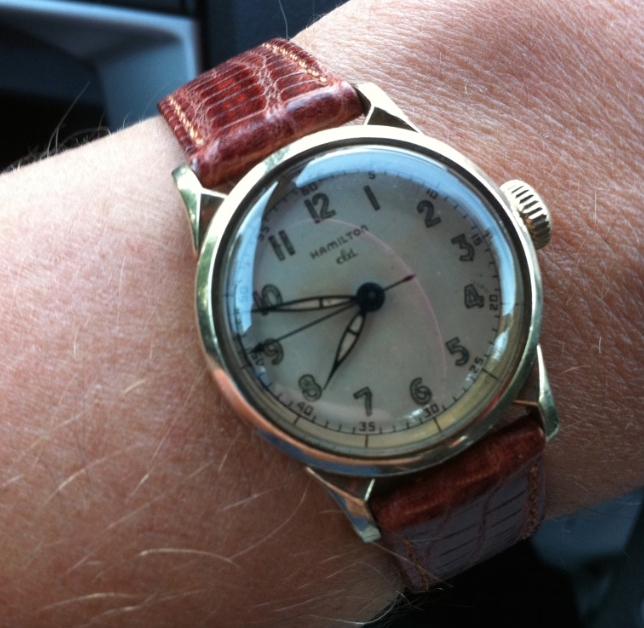 On the wrist, the Nordon is a nice watch... small by todays standards but quite typical for a 1940's watch. I just received two watches (1936 Lawrence and a 1948 Nordon) and your website helped me determine the models and dates of each. You're providing a wonderful resource! Awesome! I'm glad I could help. Both are fine watches. Make sure to get them serviced by a watchmaker if you don't know their service history and want to wear them a lot. That'll keep them working for another 60 years! Hi, thank you for so much information. I am in doubt, thou, I have a 10K gold filled Nordon, not a Langdon, and the movement is 747, not 748. Some Nordons had this movement? Thank your, I appreciate your help. Nordon's and Langdon's share very similar (the same) case but have different dials and movements. Nordons have a sweep second hand and use a 748. Langdons have a sub second hand and use a 747. If you have a 747 movement (and dial) in a case that says Nordon then someone swapped cases at some point. Hi. I have a Nordon (AGN Dial) The mainspring is shot. What do I replace it with? The luminous material most likely on the dial contains radium. The radium irradiates the material in the paint to make it glow until eventually it "burns out". The radium is still there but the glowing material is gone. The only way to rejuvenate it would be to replace it with modern photo luminescent paint that is charged by light. To do that, you'd need to send it to a dial refinisher like International Dial. Hi there -- My grandfather left me his Nordon...the one without the luminescent dial. I took it to a watchmaker (along with 2 other watches) and have only now -- after 19 months -- gotten them all back, completely taken apart and no fixes. (Yes, I went in every month to check on them...). The ONLY part of the Nordon returned to me was the gold back and the band...he lost everything inside...which is strange because he was only supposed to replace the glass as the watch was functioning. Sorry for the long post but, do you know a good watchmaker in the DC / VA region? Also, any idea how much a functioning,good condition Nordon would cost? Mine has this number S706873 stamped on the inside. Many thanks! Yikes! That's a terrible experience. I'm not sure how someone like that could even be in business. The Nordon is fairly common and easy to find. Just look on eBay. Condition can vary, of course. If you email me or contact me via my Etsy store I can refer you to some pros I know. If you want to look on the AWCI.com website you might be able to find other more local professional watchmakers. Anyone know the correct crystal for a Nordon ? I've also seen dials without the 'cld' are these re-dial's or authentic ? A GS PA 318 crystal will fit nicely. It's plastic and not glass. An original glass crystal is known by the model name and shared with the Langdon. They can be found but it takes some effort. Some years had "CLD" on the dial and some not - that's not to say the presence of CLD means it's original. 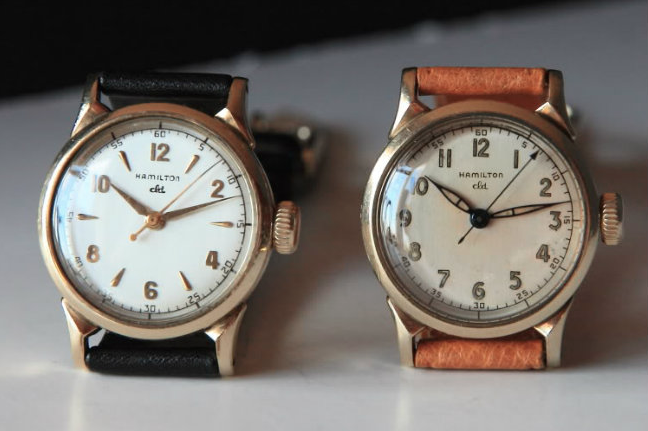 Refinishing Hamilton dials is generally not a big detractor, as long as it's done correctly. Can you advise if this is the correct one, PA318 Swiss 25.5mm ? The Norde and Nordon are the same other than case material. The GS PA 318 will fit. Any tips on where I may be able to find a new female part of the two-part stem for a Nordon. (Part 615270 I believe). Nothing on ebay right now. I just picked up a Nordon but the strap it came with is really bad. Any suggestions of sites that have some nice ones? What size does it take? Great site, thx for all the great info! Hello, hopefully you'll still see this, I recently purchased a Nordon and wondered about restoring or replacing the dial. Do you have a resource to find these dials? The dial can be professionally refinished to look as good as new. You'd need to send just the dial to International Dial Co. Of course, the Nordon is a pretty common model so you could also look on eBay for a nice one to popup and use that dial.